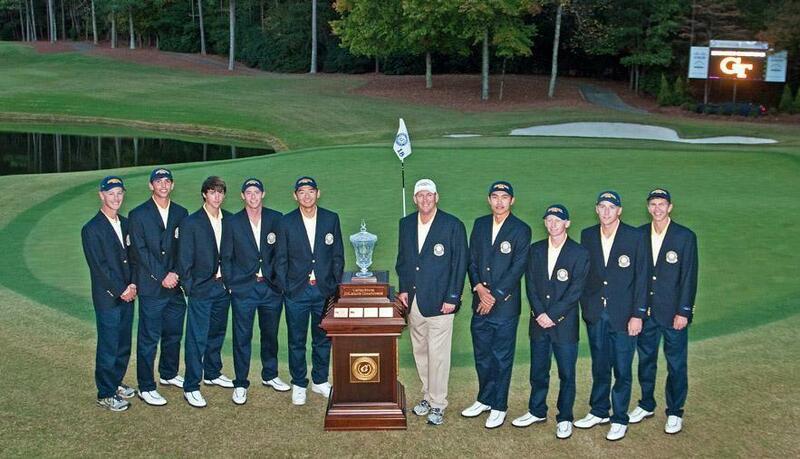 The Georgia Tech men’s golf team poses with the trophy after winning the 2012 United States Collegiate Championship at The Golf Club of Georgia, as photographed by Robert Matre on October 21, 2012. Hello friends! This time from Wilmington, North Carolina. We’re here to provide live scoring for Women’s college golf tournament in coming weekend. 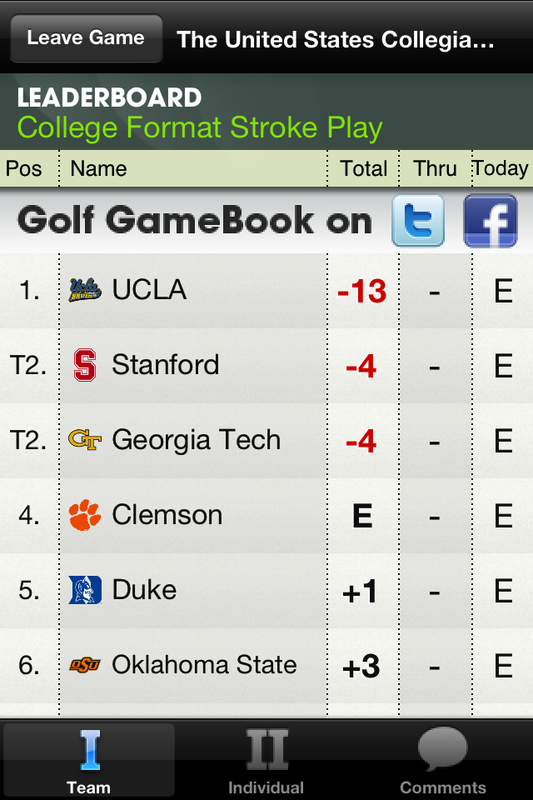 Last weekend we lauched GameBook mobile live scoring service for college golf tournaments at the Golf Club of Georgia on The United States Collegiate Championship (USCC), hosted by Georgia Tech. Everything went well and we can easily say Golf GameBook proved its strength with easy to use score entry for the scoreres following each group and a new interface for live leaderboards for coaches and fans to follow. Feedback was incredibly good and we really appreciate how well people welcome us to the event and how good and honest feedback they gave to us. This is how our college tournament’s team leaderboard looks like. Cool, isn’t it? My time to give some feedback: I have seen lots of different golf tournaments last years – Amateur and Pro tournaments. This was one of the best organized. PGA Tour-style setup with hospitality tents, media rooms, stands etc. Have to take my hat off for Georgia Tech’s Golf Team, Coach Bruce Heppler, The Golf Club of Georgia and for all who played some role in tournament organizing. Great job! “Golf GameBook was a tremendous way to follow scoring of the teams and players around the golf course, and easy to use and navigate for parents, friends and spectators, not to mention the coaches and media. The graphic presentation is very easy to read, and it includes all the information you want”, said Mike Stamus, Director of Georgia Tech Sports’ Media Relations. Was nice to see that all the spectators, coaches and stuff were staring their phones all weekend 🙂 We showed that GameBook saves a lot of time and effort on the tournament scoring administration and makes the live scoring experience easier and fun for spectators! GameBook Team together with Mr. Stwart Cink in Cink on Challenge’s Dinner and Auction at the River Club Lodge. 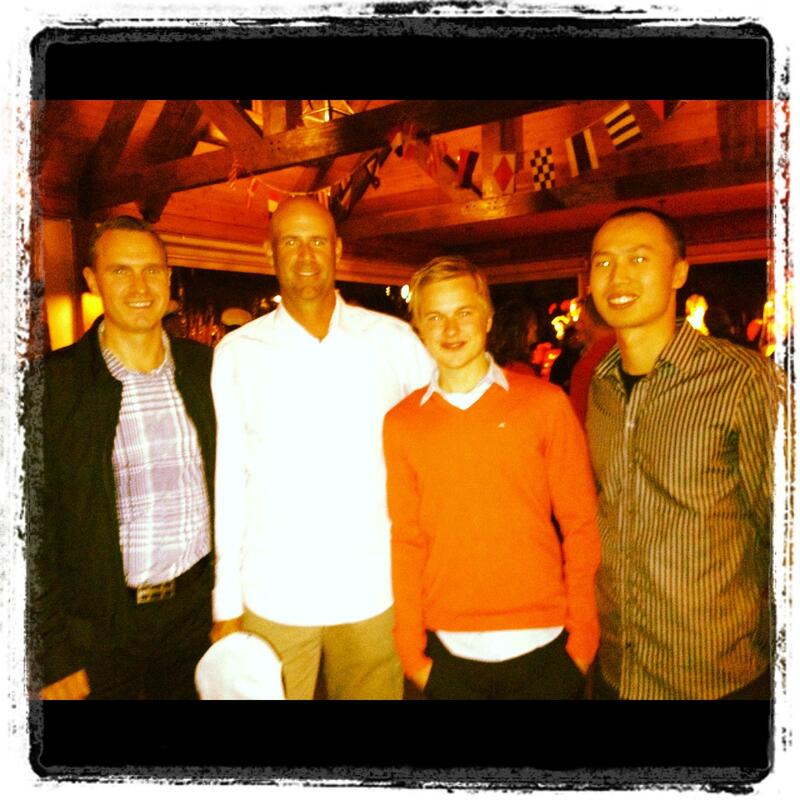 Mikko Rantanen on the left, Stewart Cink, Me and Bo Wang alias bowang. After the USCC we continued staright to The River Club, Suwanee, Georgia. Open Champion, PGA Tour player and GameBook member Stewart Cink hosted his charity tournament called Cink it Challenge there and used of course GameBook’s live scoring. What a great day we had there! Stu, his friends, supporters and sponsors as well as couple of other PGA Tour pros (Heath Slocum and Jason Bohn for expample) played 18 holes, took a serious advantage of GameBook’s trash talk feature and experienced the extra value GameBook will bring to the event. For me, this was the first time I met Mr. Cink. Like I’ve heard, he is a true gentleman. Professional athlete with big, warm heart. Not a single rock star gesture. Scoring volunteer entering score to Golf GolfGameBook. We got thanks how easy our system is to use. Even if you are using it for the first time. Have a ball this spring with Golf GameBook!